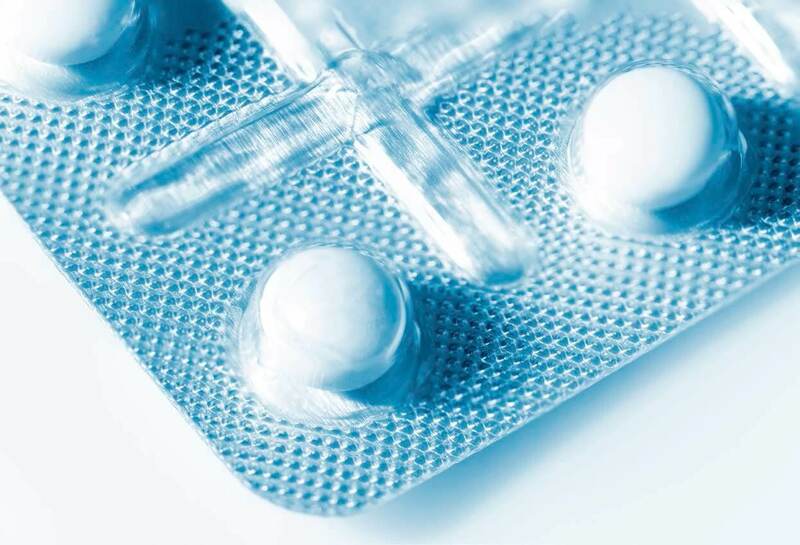 The first marketed selective T-type calcium channel blocker mibefradil was withdrawn due to adverse drug interactions, prompting the search for new scaffolds. 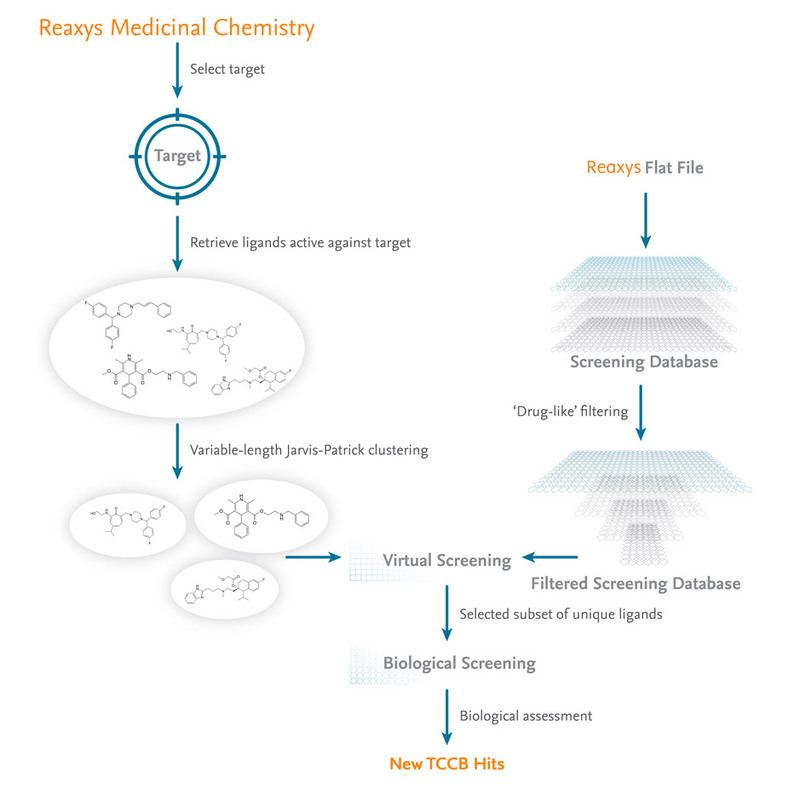 This paper describes a workflow using Reaxys® Medicinal Chemistry to assess chemical and biological information and the Reaxys Flat File as a source of chemical diversity for ligand-based virtual screening. A novel T-type current underlies prolonged Ca2+- dependent burst firing in GABAergic neurons of rat thalamic reticular nucleus. J Neurosci 12: 3804–3817. Molecular physiology of low-voltage-activated t-type calcium channels. Physiol Rev 83: 117–161. Voltage-gated calcium channels as targets for analgesics. Curr Top Med Chem 5: 539-546. .
Voltage-gated calcium channels as targets for analgesics. Curr Top Med Chem 5: 539-546. . However, only limited progress has been made in the quest to identify both potent and selective compounds for T-type channel blockade. 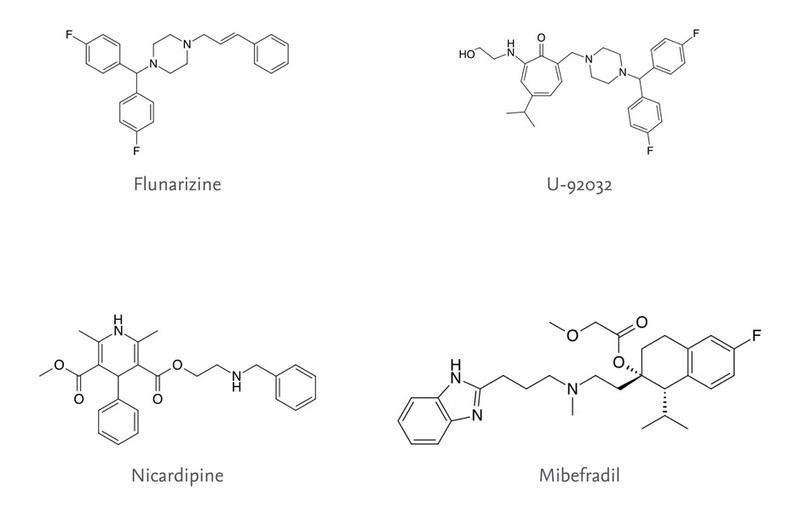 The Ca2+ channel blockers such as flunarizine, U-92032, nicardipine and mibefradil (Figure 1) have been reported as active T-type Ca2+channel blockers (TCCBs). Mibefradil, the first marketed selective TCCB inhibits the T-type Ca2+ channels 10−30 times more potently that L-type Ca2+ channels. It was finally withdrawn due to its pharmacokinetic interactions with other drugs metabolized by cytochromes P450 3A4 and 2D6. Therefore, new TCCBs having new scaffolds are required to understand the exact role of T-type Ca2+ channel in cellular functions. Herein, we report the application of Reaxys Medicinal Chemistry as an essential starting point for gathering critical biological and chemical information required to feed into ligand-based virtual screening (Figure 2). The data generated was used with bi-dimensional 2D pharmacophoric fingerprint software to identify a new series of TCCBs. The virtual hits were put through a functional assay on the Cav3.2 isoform to assess their biological activity. The first step in the search for a new TCCBs is to collect all pertinent chemical and biological information related to TCCBs, in particular the Cav3.2 isoform (Figure 3). 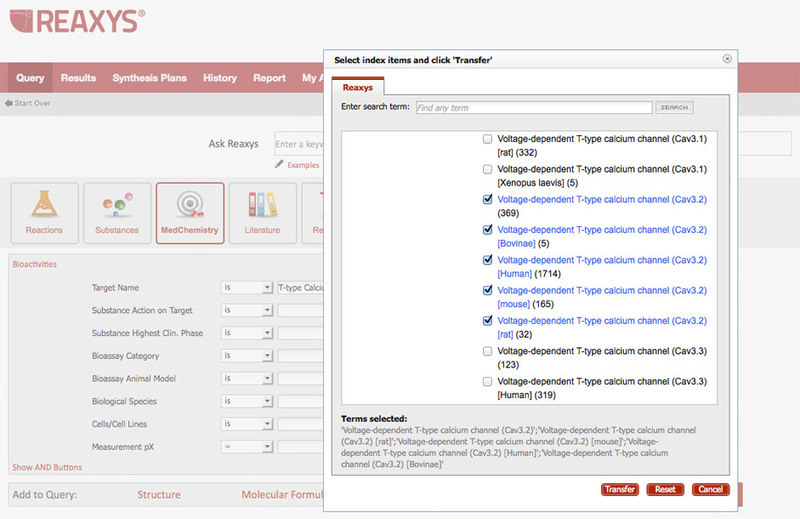 Searching by target name, initially under ion channels and then by narrowing the search down to voltage-dependent calcium channels, followed by selection of the specific isoform enables easy retrieval of all the relevant chemical and biological data from Reaxys Medicinal Chemistry. To facilitate comparisons of bioactivity data from different publications and assay types, all the data points in Reaxys Medicinal Chemistry have pX values. pX values are calculated by transforming parameters such as EC50, IC50 and Ki into the –Log equivalent (pEC50, pIC50, pKi). These are normalized values assigned to the data that enable easily quantification of compound–target affinity and compare information from all around the world. The target search for the Cav3.2 isoform of TCCBs in Reaxys Medicinal Chemistry retrieved the chemical structure of 1,854 ligands active against that specific target. These 1,854 ligands have 2,285 bioactivities associated with them and were extracted from 77 citations (Figure 4A). Figure 4. A The Heatmap for all the ligands with activity against the Cav3.2 isoform of TCCBs. 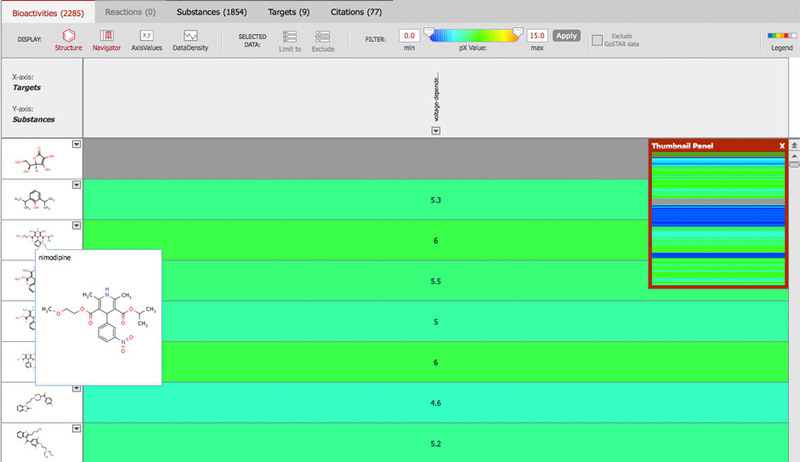 B The Heatmap for ligands with a pX activity above 6.0 (affinity < 1 μM). 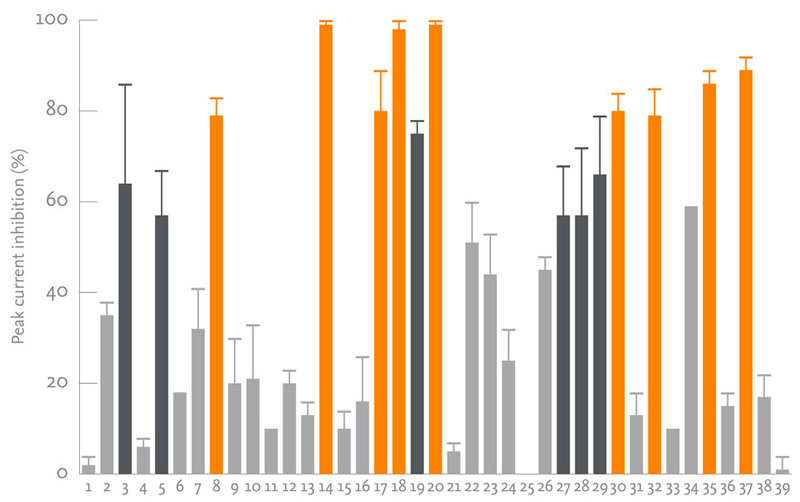 An affinity profile for the most potent ligands active against the Cav3.2 isoform of TCCBs, with pX values greater than 6.0 (affinity < 1 μM), can be generated and viewed as a Heatmap (Figure 4B). 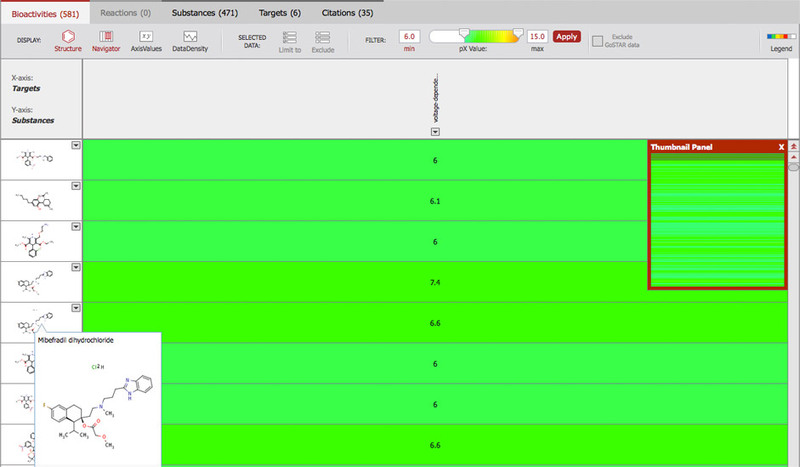 The Heatmap visualizes the relationships between ligands and their targets in terms of key parameters, allowing rapid identification of relevant ligand–target interactions. The map displays all ligands with a pX above 6.0 and the associated target TCCB protein for which in vitro biological data has been mined from the literature. In the Heatmap, biological affinities or activities are quantified as a pX value and displayed from 1 (low activity) in blue to 15 (high activity) in red. At the time of this analysis, this query resulted in 471 ligands with a pX value of above 6.0 (affinity < 1 μM) against the TCCB target. Some of these molecules are depicted in Figure 5. These molecules were then clustered using variable-length Jarvis-Patrick clustering. The query set was narrowed down and the central molecules of resulting clusters and singletons was used for building the 2D pharmacophore in the virtual screening analysis. A multitude of key parameters can be explored to aid understanding of the ligand−target interactions, such as drug-like grading, in vitro efficacy, in vivo animal models, metabolism, pharmacokinetic and pharmacodynamic data, and clinical use/application, as well as extensive information on the chemical structure itself. 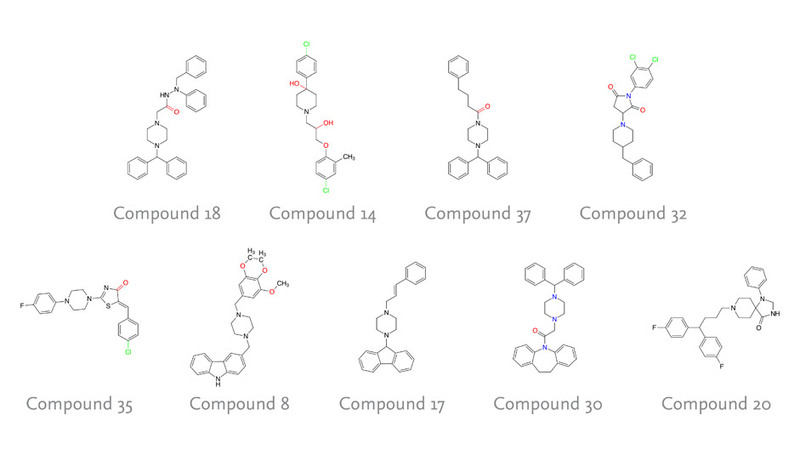 For example, Reaxys Medicinal Chemistry can be used to get detailed metabolic data for each compound/ligand (Figure 6). For each data point, the parameter measured, the value, target, target species, tissue/organ, dose and reference are all shown and both quantitative and qualitative results available in the database. This aspect would be particularly beneficial considering that Mibefradil was withdrawn from the market due to the inhibition of cytochrome P450 enzymes 3A4 and 2D6, which had the potential to lead to serious drug−drug interactions. Figure 6. All of the detailed information on the metabolism of mibefradil can easily be retrieved: the IC50 value for activity against CYP3A4 and CYP2D6 along with the corresponding reference is highlighted. Over the past few years, virtual screening has emerged as a complementary approach to high-throughput screening and has become an important in silico technique in the pharmaceutical industry. It includes ligand- and structure-based methods. Pharmacophore modeling is one such approach where known active molecules are analyzed for common steric and electronic features responsible for drug−receptor interactions. Alternatively, protein−ligand crystal structure complexes can be used to construct specific receptor-based pharmacophore models. In this workflow, a ligand-based approach was selected to quickly identify novel TCCBs using bi-dimensional (2D) pharmacophoric fingerprints (FP) based on the clusters obtained from the Reaxys Medicinal Chemistry data retrieval. Prior to this, an external molecular database was constructed and maintained. Millions of compounds coming from Reaxys Flat File were loaded into a database. After applying Lipinski drug-like filters, subsequent processing done on the screening database, included salt removal, duplicates suppression and standardization. Next, by calculating the pharmacophoric fingerprints, the chemical space representation of these molecules was assessed. Ideally, two sets of fingerprints will be computed: ChemAxon’s Pharmacophoric Fingerprints or PF and CCG’s GpiDAPH3 fingerprints implemented in the MOE suite. Particularly for PF, several parameters have to be optimized for FP generation. Molecular diversity and chemical originality. Finally, based on a visual inspection, a subset of 39 unique molecules was selected for further biological evaluation. The subset of 39 unique molecules was tested on HEK293 cells transfected with the human Cav3.2 isoform. The compounds were purchased and tested at 10 µM for their ability to affect the functional activity of recombinant human Cav3.2 and the results are displayed in Figure 7. In total, 15 compounds were found to inhibit the Cav3.2 channel at >50% inhibition and of those 9 displayed very promising activity with >75% inhibition (Figure 8). In this study, a proposed workflow was described for identifying new TCCBs from a structurally diverse dataset of known active compounds using virtual screening procedures incorporating various bi-dimensional chemical and pharmacophoric fingerprints. Reaxys Medicinal Chemistry was used to easily and efficiently retrieve all relevant chemical and biological information for existing TCCBs and Reaxys Flat File as a source of chemical diversity. 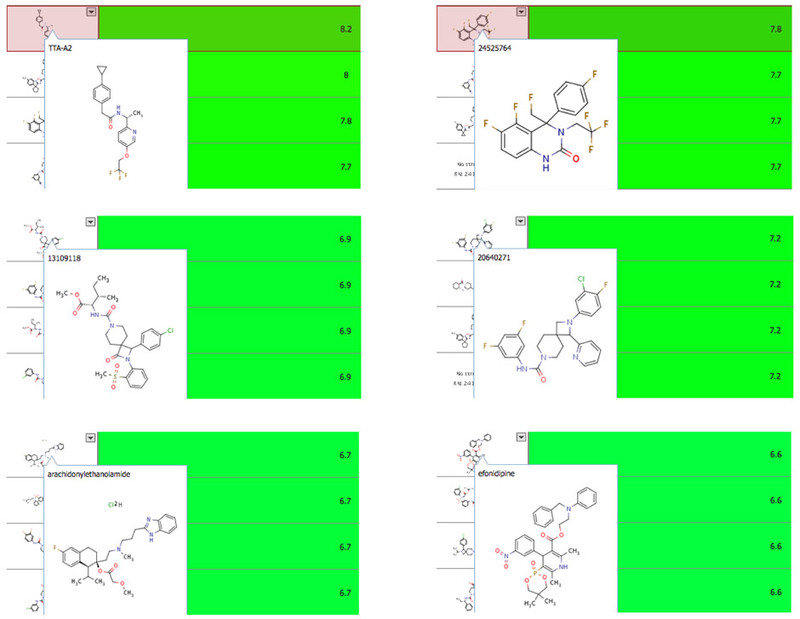 During hit selection from the virtual screening, further analysis of the potential ligands can be done, for example, to identify potential drug−drug interactions earlier in the discovery process. Reaxys Medicinal Chemistry is an extensive databasecontaining chemical information linked to in vitro and in vivo biologicalactivities extracted from over 300,000 articles, 90,000 patents and 5,000journals. More than 6 million chemical compounds are associated with theirbiological data (> 29 million bioactivity data points) and linked toinformation on 12,700 pharmacological targets, allowing the scientists toreveal connections between compounds, effects and targets. The data is indexedand normalized for maximum searchability and consistency. Huguenard, J.R. and Prince, D.A. (1992) A novel T-type current underlies prolonged Ca2+-dependent burst firing in GABAergic neurons of rat thalamic reticular nucleus. J Neurosci 12: 3804–3817. Perez-Reyes E. (2003) Molecular physiology of low-voltage-activated t-type calcium channels. Physiol Rev 83: 117–161. Bourinet, E. and Zamponi, G.W. (2005) Voltage-gated calcium channels as targets for analgesics. Curr Top Med Chem 5: 539-546.